Add the raw cauliflower to a food processor until its rice texture. Add that to a pan with olive oil, chopped zucchini and shredded carrot with some salt, pepper and garlic powder. Cook for about 8 minutes until it starts to get brown fried color and then add a splash of soy sauce and sesame oil and stir that up. 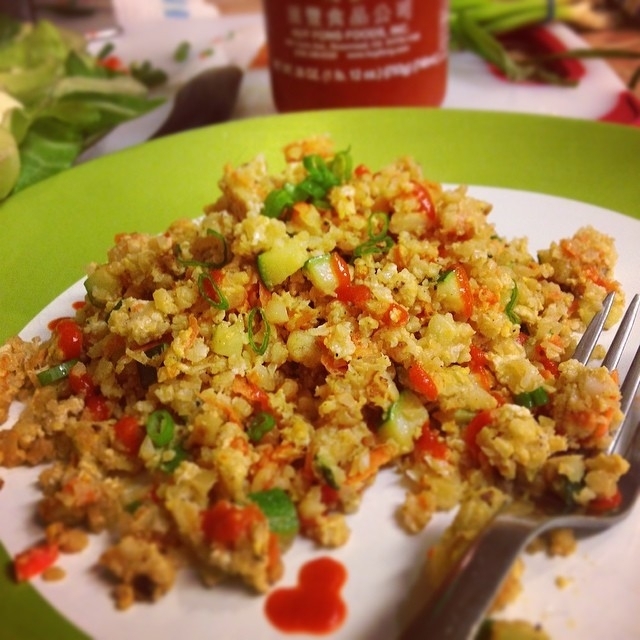 Crack 2 eggs in the middle and as soon as it's cooked and mixed in add some sriracha and green onions! Feel free to jazz it up any way you like with different vegetables, or even adding meat.